A week of rain has drowned my vegetable garden but not the spiders. The determined little survivor above is a yellow garden spider, Argiope aurantia, I think. The spider's position in my fig tree limited my access to a view of its underside, and photos I found online are all of a view from the top down. 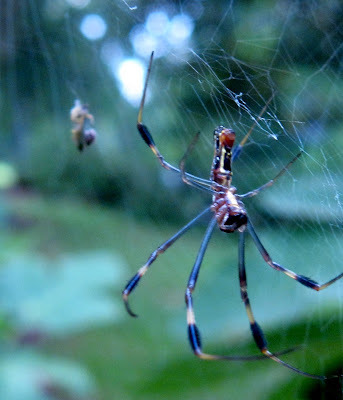 My contortionist attempts for a better angle jiggled the web and sent Mr. or Mrs. Spider into a homo sapiens-induced icky dance, an arthropod version of the spastic jumping around some people (meaning me) do when they run into a spider web. I have no idea if the spider above is a male or female. The University of Arkansas Arthropod Museum site noted that males do build webs but can be found in females' webs since the guy spiders tool around looking for romance. We've been getting a lot of afternoon showers here, too. I don't know if it's too little too late for our little garden or not. So far we've had 4 tomatoes, 3 squash, and 1 cucumber for our thirty dollar seed investment! My husband has enjoyed the gardening challenge though. So sorry I haven't taken time to comment lately, but I read the posts. First of all, your newest grandchild is absolutely gorgeous! I know you must totally agree! Next, I can identify with the sugar daddy pulling off the crown. I don't have a crown(yet), but I lost a filling to a mary jane! Getting old is the pits! So the veggies drowned, but not the spider? What luck! For thirty dollars worth of seed, so far we have harvested 4 cherry tomatoes, 3 squash, and a cucumber...Hummm, sort of expensive produce! @Kathy-This year the gardening payoff has been the pleasure and satisfaction of "grubbing in the dirt," as my husband calls my largely unproductive gardening efforts. Hope you will be enjoying more fresh home-grown veggies soon. And yes, I agree that our new grandson rocks! What an incredible photo - and what patience and skill you must have. Thanks for sharing. @Freda-Thank you for stopping by and for the positive feedback!